In the past, tilt lenses (Perspective Control / Tilt Shift) have been purchased then rarely used. This was due primarily to the lack of easy to understand information on how to effectively use them. That was then and this is now! 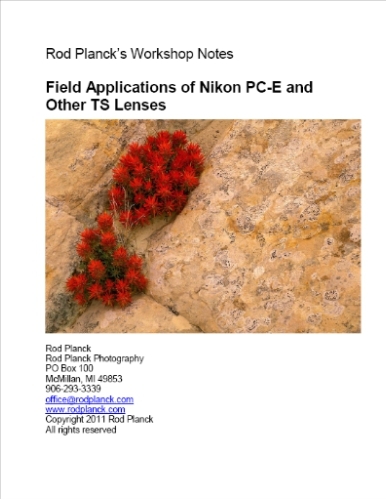 With the release of Field Applications of Nikon PC-E and Other TS Lenses Rod has provided easy to understand text to explain what can be an incomprehensible subject for many - using a tilt lens. After reading this book and following Rod's step by step instructions you'll be able to go out into the field and use a tilt lens to make stunning images with complete confidence. This beautifully illustrated and well written 90 page e-book is jammed packed with vital information. It is a must for any photographer who currently owns a tilt lens (PC-TS) or is considering the purchase of one. Shifting, What is its Application? What Focal Length (PC/TS) Lens Should You Purchase?